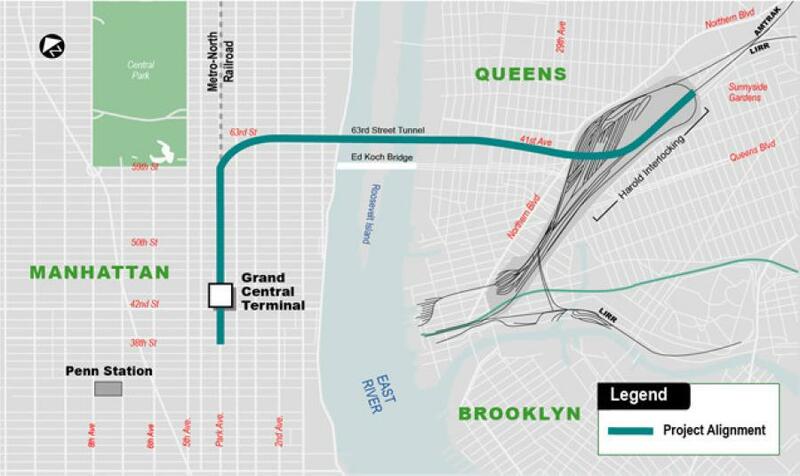 The aim of the East Side Access project is to create a new, direct route for riders of the Long Island Rail Road to and from Manhattan's East Side, alleviating traffic that currently flows through the chaotically congested Penn Station, on the island's West Side. On a recent morning, MTA officials led a walking and stair-climbing tour to showcase progress on the unfinished, cavern-like terminal with ceilings as high as six stories. Dozens of high-speed escalators are being built to lead down to a 350,000-sq.-ft. LIRR concourse with marble already laid on its walls and space reserved for retail shops and dining areas. It will be the hub for 8 miles of new tunnels blasted and drilled out from 400 million-year-old bedrock, winding their way under Park Avenue and the East River and on to Queens and Long Island. MTA officials have blamed such factors as the difficulty of carving through the bedrock, the need to work around an active transportation system and the challenge of carting away 75,000 truckloads of rock, mud and other refuse. Much of it was used as fill in parks and other projects.